See Interactive Map and Open Data. Though Barbados has the smallest area claimed by Venezuela, it stands to loose an area equivalent to nearly 70% of its land mass. Trinidad & Tobago stands to loose an area equivalent to nearly 90% of its land mass, along with access to the Atlantic Ocean. 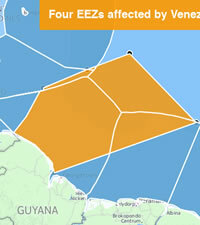 Guyana stands to loose 85% of its EEZ including Territorial Sea areas, as well as access to the Atlantic. Suriname stands to loose 34,419 sq. km (26%) of its EEZ and be left with a 26km wide "gateway" to the Atlantic. Venezuela's claimed EEZ also goes beyond the 200 nautical mile convention followed by other nations and instead extends out to 350 nautical miles from land, thereby also claiming 59,982 sq. km of the Continental Shelf/ High Seas. Effectively too the Venezuelan military is instructed to operate within 26km of the EEZ of France (French Guiana).